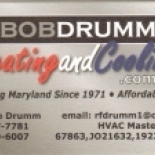 Bob Drumm Heating And Cooling. Com in Baltimore is a company that specializes in Computer Related Services, Nec. Our records show it was established in Maryland. (434) 577 781 410 279-6007 Call Now!